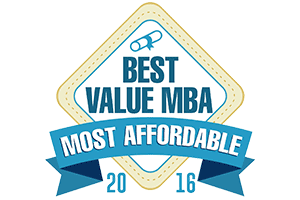 The MBA is a time-honored milestone in the path to business leadership. But more and more, businesses are looking for skills that go beyond the traditional. They’re looking for leaders who are driven to pursue growth in a business climate that is diverse, dynamic and demanding. These new skills include the ability and willingness to take calculated risks and build smart, agile teams that deliver results. You can expect to develop these talents as you complete the William Woods University online MBA program. The MBA program at William Woods University is accredited by the ACBSP (Accreditation Council for Business Schools and Programs) as well as the Higher Learning Commission. It’s designed to fit the schedules of working professionals and can be completed in two years or less through online courses. To make this an investment you can count on, as long as you stay continuously enrolled, your tuition will not go up. In this program, you can expect rigorous coursework with real-world relevance, designed and taught by professionals who have proven their expertise in the corporate world. The online MBA degree’s strong theoretical background is balanced by an emphasis on practice that puts theory to work. The skills you develop in our online MBA program — leadership, financial competency, organizational theory, information systems and more — will show your organization that you are ready to take your place among its leaders. Chief among these skills is decision-making, which will help you find new ways to lead and create solutions in a world of constrained resources, environmental challenges and competitive global markets. You will earn the degree by completing twelve 3-credit courses, including a capstone project you will present to an outside panel of business experts. You may also pursue an emphasis in the areas of Small Business or Global Business. Mardy describes himself as “Elected Official, Policy Wonk, Economic Developer and Planner.” He is the Founding Principal of ICS Advisors, a project management and business advisory firm specializing in financial analysis, business planning and development, M&A, economic planning and forecasting, and social media marketing. Makele has 10 years of federal and state government experience in the area of Human Resources, collaborating with Missouri Department of Agriculture, Forest Service, Animal Plant and Health Inspection Services, Administrative Hearing Commission, and the Bureau of the Public Debt. It’s not always about being the next Warren Buffett. You may have a unique plan to serve the nonprofit world, or develop a social enterprise that does well by doing good. Bring it to us and see what happens. We’re not just committed to helping you move up the ladder; we are committed to creating pathways and possibilities for the most unique and exceptional career plans to flourish.